The financial media often mentions three different terms relating to government bonds: Treasury bills, Treasury notes, and Treasury bonds. These securities are similar in that each is issued by the United States to fund its debt, and each is also backed by the full faith and credit of the U.S. government. Two key differences exist between the three types of U.S. Treasuries: their maturity dates and the way that they pay interest. It pays to understand them before you consider making an investment in government bonds. The variance in maturities of the three types of Treasury securities helps differentiate them. Treasury bills (or “T-bills”) are short-term bonds that mature within one year or less from their time of issuance. T-bills are sold with maturities of four, 13, 26, and 52 weeks, which are more commonly referred to as the one-, three-, six-, and 12-month T-bills, respectively. The one-, three-, and six-month bills are auctioned once a week, while the 52-week bills are auctioned every four weeks. Since the maturities on Treasury bills are so short, they typically offer lower yields than those available on Treasury notes or bonds. 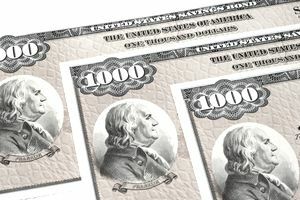 Treasury note issues have maturities of one, three, five, seven, and ten years, while Treasury bonds (also called “long bonds”) offer maturities of 20 and 30 years. In this case, the only difference between notes and bonds is the length until maturity. The 10-year is the most widely followed of all maturities; it is used as both the benchmark for the Treasury market and the basis for banks’ calculation of mortgage rates. Typically, the more distant the maturity date of the issue, the higher the risk of payback to investors, and so the higher the compensating yield. The other key difference is the way Treasury bills pay interest. Like a zero-coupon bond, You would buy T-bills at a discount to par, where par acts like the bond's face value. This discount is determined at the auction. “Par” is $100, or the value at which all T-bills mature. For instance, you could pay $98 for a bill that will eventually mature at $100. The $2 difference between the auction price and the maturity price represents the interest you receive on the T-bill. The New York Federal Reserve Bank’s website provides a brief explanation of how to calculate the effective yield of a T-bill based on its price and time until maturity. In contrast, both Treasury notes and bonds pay a traditional “coupon,” or interest payment, every six months. When these securities are auctioned, they may sell at a price that translates to a yield to maturity higher, or lower, than that of the coupon. Investors can purchase bonds directly from the U.S. treasury, through its TreasuryDirect website. The Treasury's site explains how the interest rate and price of a bond are determined at auction. Once T-notes and T-bonds are issued, their prices fluctuate, so their yields remain linked to market prices. For example, say the government issues a 30-year bond with a yield of 10 percent when interest rates are high. In the next 15 years, prevailing rates fall significantly, and new long bonds are being issued at 5 percent. Investors will no longer be able to buy the older T-bond and still receive a yield of 10 percent; instead, its yield to maturity will fall, and its price will rise. In general, the longer time until the bond matures, the greater price fluctuation it will experience. In contrast, T-bills experience very little in the way of price fluctuation since they mature in such a short amount of time.